First off, let me say that I started reading these plays nō-ing nothing about Kabuki or Nō theater, just that I have always admired Japanese dramatic arts even though I couldn't much understand it. It is like listening to Shakespeare for the first time, in high frequency. A little research ( ok, very sparse research ) went a long way to assimilate to the subtle nuances of this medieval art form. Nō, literally translated as "skill or ability" - the lyrical, traditional Japanese style of theater drama - draws its distinctive structure from ancient ritual and folk dances. It is essentially a poetic, quasi-religious, musical drama - without the dramatic conflict. Nō possesses inherently a remoteness from the reality of life, indirectness and abstract analogy, a composite of ancient myths and legends. Zeami Motokiyo (1363-1443) created the canonical framework of Nō out of contemporary but disparate customs, drawing on a precise knowledge of Japanese aesthetics, of long-established poetics and Buddhist teachings. The characters in Nō are closely linked to the concept of human nature, stemming from the religious principles of Zen Buddhism, representing mystical and spiritual perceptions. Yukio Mishima (1925-1970) novelist, poet, dramatist, film director, army officer, is lauded as the first successful author of modern Nō plays. His intentions were to transform the centuries-old Japanese aesthetic form - which embody ambiguity, simplicity, vague language and deep-rooted Buddhist doctrine - into more of an intellectual and intelligible scheme, while still preserving the sensitivity and symbolism of the ancient form of Nō. He helped bring a stylistically 14th century art form into the 20th century. 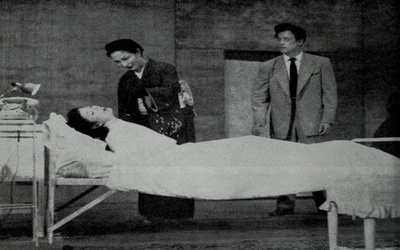 Contrasting the old and new in his modern Nō, Mishima keeps the same titles and basic plots of the older plays, but uses contemporary speech, natural body language and stage settings. 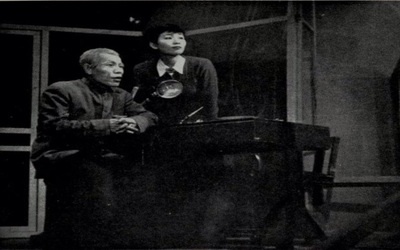 While in Zeami's Nō: feelings of passion are evoked in the observer, Mishima elicits intellectual response. While traditional Nō might stimulate a spiritual sense with overtones of lightness and life, Mishima generates anxiety with components of death. 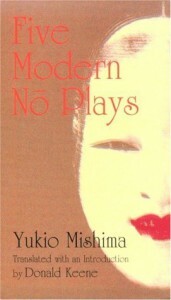 As a result, these five plays have morphed into concrete versions of their abstract past selves, still representing the essence, the symbolic quality and suggestive elements of the originals* even in their crude modern settings; they are comprehensible and accessible to the otherwise ill-exposed Nō audience. Mishima's recreations stir-up excitement and tension, are metered in pace, tone, temper, and atmosphere. The narrative is tight, controlled, concentrated, not one word lies in waste. Sotoba Komachi- set in a public park on a bench, a poet and a hag talk about the beauty she once was, and in so doing, he is 'bewitched' in viewing her as the archetypal woman who dominates the male psyche. The Damask Drum- the old janitor of a building declares his love for a woman in the adjacent office, is given a message to beat the damask drum to win her love, only to be laughed at. 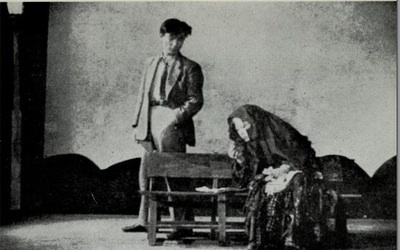 In humiliation, he commits suicide. A supernatural design unfolds. Kantan- a traveler naps on a magic pillow and dreams of a glorious life as Emperor of China. He awakens unable to distinguish dream from reality. 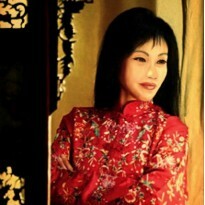 The Lady Aoi - a version of the tale of Genji love triangle takes place in a hospital setting. The gothic good vs evil is reminiscent of a Japanese horror flick - as a fan of such, this was my favorite! Hanjo- about a teahouse geisha who exchanges fans with a gentleman as a promise of marriage, only to suffer madness by his abandonment of her. This story involves homosexual love and the only one that ends happily. For the poorly diverse, opportunity-deprived but eager spectator of Japanese theater like myself, Mishima has provided coherent interpretation and exciting entertainment in these dramas, infusing his own flair for the dark and macabre, conjuring up a mysterious, mesmerizing, evocative, at times gothic world in which I enthusiastically enjoyed being immersed.